The makers of this road sign got the spelling right. If you want a change of pace and something far less momentous than Jihadi terror to worry about, how about calling Albany streets by their correct names? Spring Hill Road comes to mind. It’s three words, as the road sign on the Albany-Corvallis Highway makes plain. All too often lately, I’ve seen Springhill Road or even Springhill Drive, as some Benton County zoning maps have it. I don’t know where that contraction comes from. The road is named for a real hill, and its name is Spring Hill. You can look it up on a good map such as that published by the U.S. Geological Survey for the Lewisburg Quadrangle (1970 version, photo-updated in 1986). 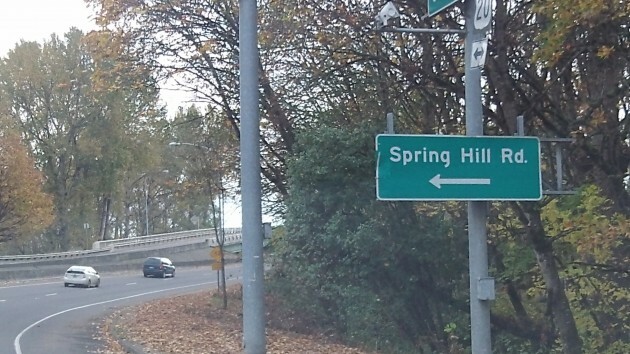 Spring Hill is the high spot in the North Albany countryside that is crossed in an east-west direction by Valley View Drive. Why the hill’s name was not applied to the road that goes over the top of it, I have no idea. Instead, our ancestors in this part of the world named the valley road for the hill, and the hill road for the valley. Contrarians, evidently. Elsewhere in Albany, it is useful to remember that with rare exceptions, the named and numbered east-west streets are called avenues, except along lakes, in which case they are drives. And north-south streets are called streets or drives or something else. It hasn’t always been this way. When sidewalks in the old part of town were poured early in the 20th century, the workers doing the concrete curb inscriptions called everything a street. But that was then and this is now. So the numbered streets are avenues, and don’t you forget it.